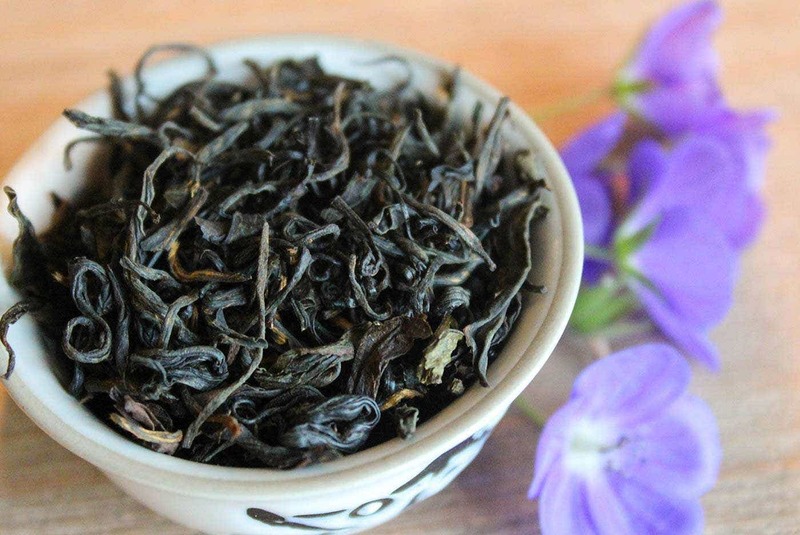 Verdant Tea is moving our main operations to China! As part of our move, our current collection of blends will be sold until stock is exhausted, and then archived. 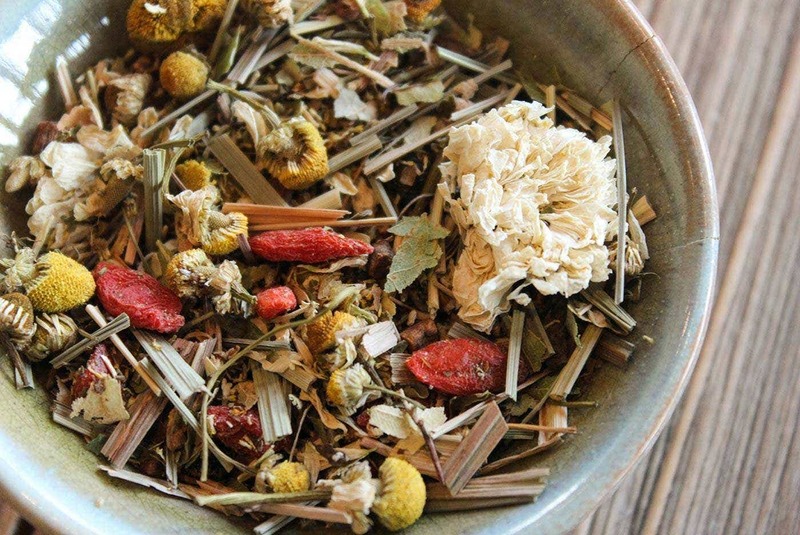 This will make room for new traditional teas or blends made with traditional Chinese herbs. But that doesn’t mean you have to go without your favorite Verdant Tea Alchemy Blends! We will be sharing the full recipes and ingredient lists for each of our blends as they sell our and move into our archives. 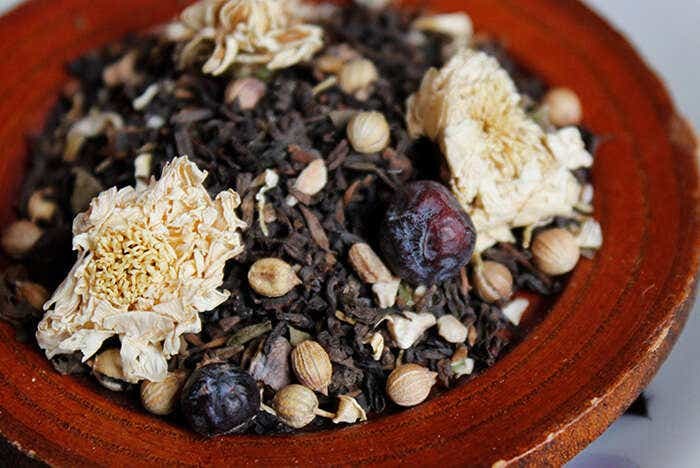 Blending is not a magical art or an impossible skill to master, especially when you start with great loose leaf tea! 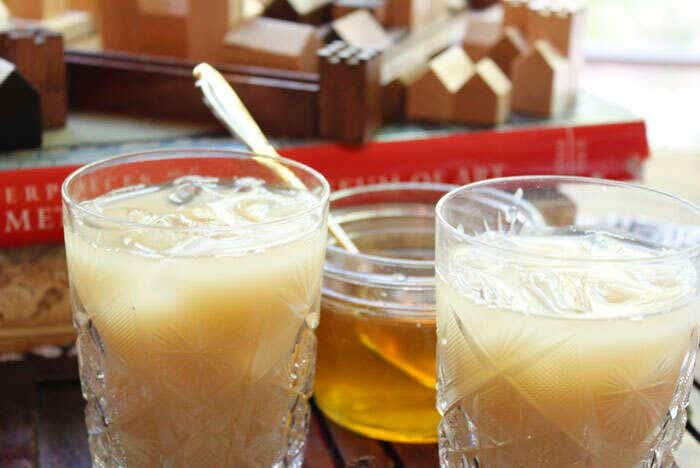 Use these recipes to recreate your favorite blends from the past, or be inspired to experiment on your own. 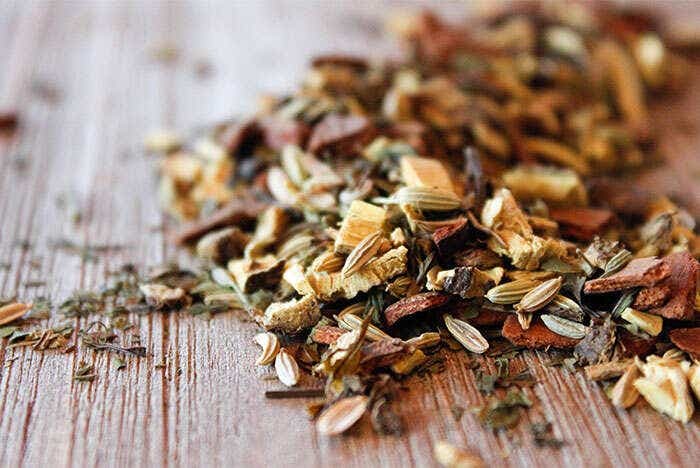 Wherever possible, we recommend using organic ingredients or herbs, spices and botanicals sourced from farmers near you. Regardless of taste, your support of responsible agriculture has a big impact, and your choices can make a real difference. Please Note: these blend recipes are for personal use only, and may not be used for commercial purposes without the express written consent of Verdant Tea. Measure and combine each ingredient in a large bowl, then stir gently with a large spoon until all ingredients are well mixed. Store in an airtight container, away from direct sunlight and strong smells. 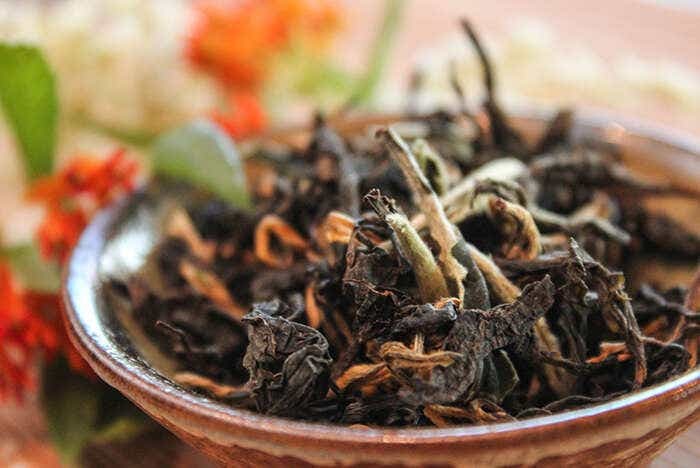 For more on storing your tea, please check out our full article. **Make sure that you source food grade bergamot oil from a reputable source. 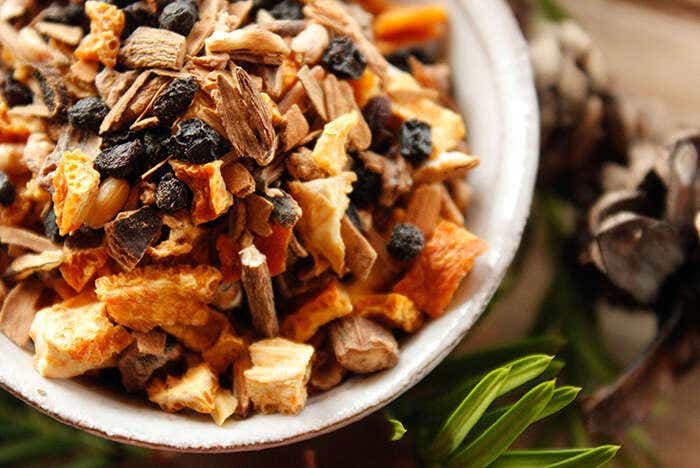 Measure and combine the tea and botanicals in a large bowl, stirring gently with a large spoon until all ingredients are well mixed. In another bowl, add drops of Bergamot oil around the edges of the bowl, and then swirl to even coat the surface of the bowl. 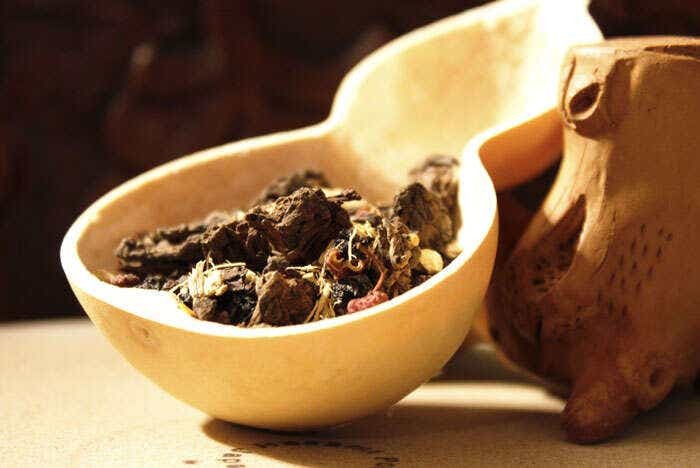 Add the blended tea to this bowl, stirring with the large spoon to make sure of an even coverage. Cover the bowl with cling wrap and allow the aroma to infuse into the blend for 4-8 hours. Store in an airtight container, away from direct sunlight and strong smells. In a wide shallow pan, combine the Wild Rice and Jasmine Rice. Keep the pan dry; do not add any oil, etc. On low heat, toast the rice, stirring constantly with a spoon to keep the rice from burning. Pour into a bowl to cool for at least one hour, or until the rice is cool to the touch. Measure and combine each dry ingredient in a large bowl. Measure out the vanilla bean pods, and cut with culinary scissors or a chef’s knife into sections about 1/8″ long. Stir gently with a large spoon until all ingredients are well mixed. If you prefer a stronger vanilla flavor, or you can’t find whole vanilla bean pods, you can add Vanilla Extract. In another bowl, add drops of Vanilla extract around the edges of the bowl, and then swirl to even coat the surface of the bowl. Add the blended tea to this bowl, stirring with the large spoon to make sure of an even coverage. Cover the bowl with cling wrap and allow the aroma to infuse into the blend for 4-8 hours. Did you know? You can also purchase a new re-blend. of this tea from LiquidProust! Read the full story of this re-blend here. In separate bowl, add drops of Bergamot oil around the edges of the bowl, and then swirl to even coat the surface of the bowl. Add the lemon and orange peel to this bowl, stirring with the large spoon to make sure of an even coverage. Cover the bowl with cling wrap and allow the aroma to infuse into the citrus mix for 4-8 hours. 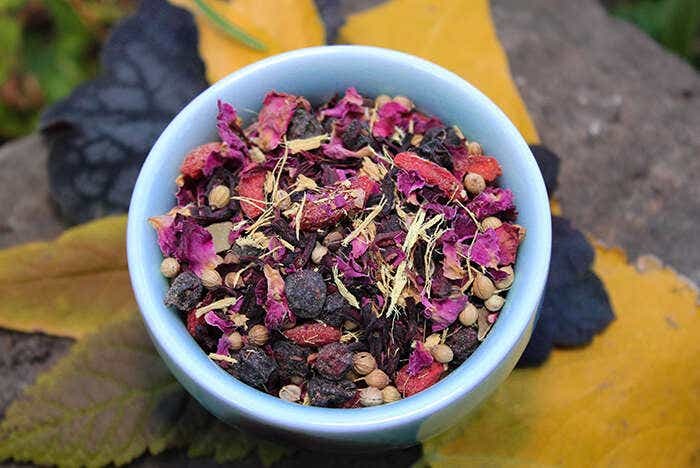 Then blend with the rose petals and traditional tea base. 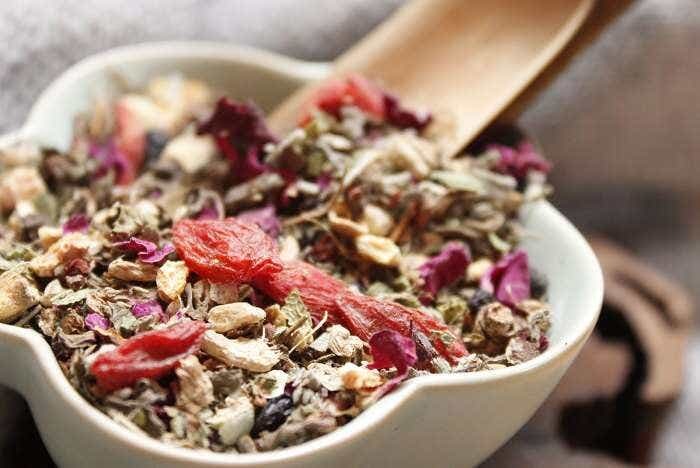 Measure and combine the tea, rose and citrus mix in a large bowl, stirring gently with a large spoon until all ingredients are well mixed. 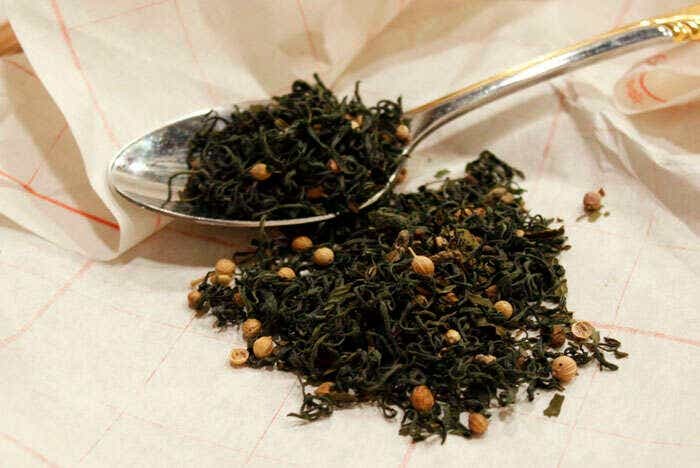 Measure and combine the teas, stirring gently with a large spoon until all ingredients are well mixed. In separate bowl, add drops of Bergamot oil and Vanilla extract around the edges of the bowl, and then swirl to even coat the surface of the bowl. Add the blended tea to this bowl, stirring with the large spoon to make sure of an even coverage. Cover the bowl with cling wrap and allow the aroma to infuse into the tea 4-8 hours. Measure and combine each ingredient in a large bowl, then stir gently with a large spoon until all ingredients are well mixed. Measure out the vanilla bean pods, and cut with culinary scissors or a chef’s knife into sections about 1/8″ long. Crush a pinch of saffron between your fingers and sprinkle over the blend. 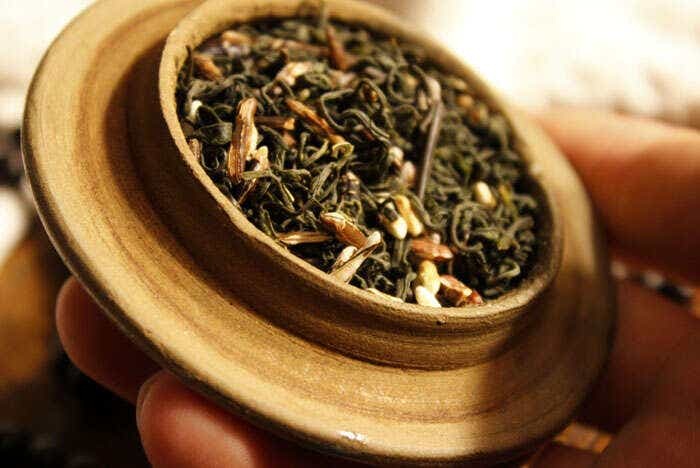 Or store your tea base and chai spice separately, to easily make hot chai with milk and honey on the stove top. 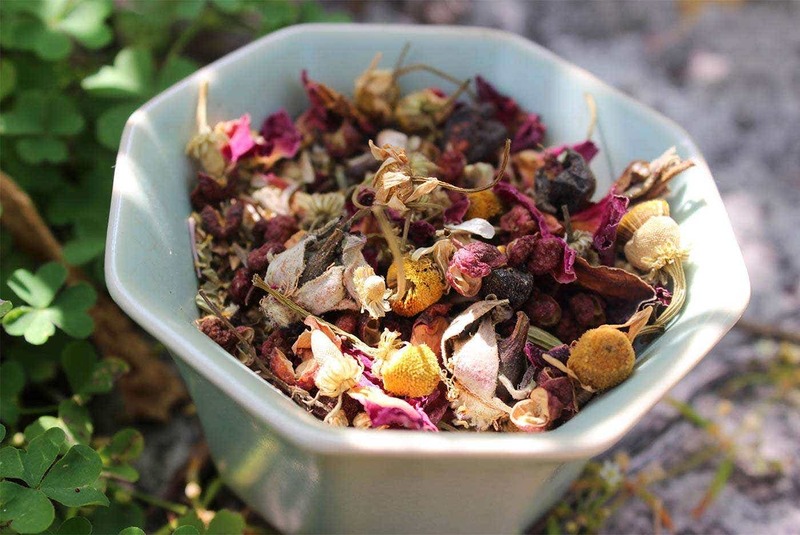 Measure and combine the tea, flowers, berries and Frankincense in a large bowl, stirring gently with a large spoon until all ingredients are well mixed. In another bowl, add drops of Bergamot oil around the edges, and then swirl to even coat the surface of the bowl. 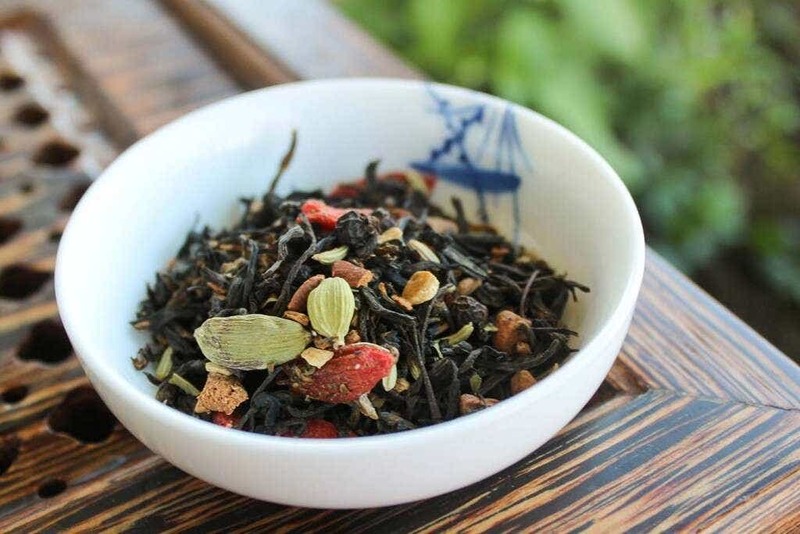 Add the blended tea to this bowl, stirring with the large spoon to make sure an even coverage. Cover the bowl with cling wrap and allow the aroma to infuse into the blend for 4-8 hours. Finally, crush a pinch of saffron between your fingers and sprinkle over the blend. Measure and combine each dry in a large bowl. Measure out the vanilla bean pods, and cut with culinary scissors or a chef’s knife into sections about 1/8″ long. Stir gently with a large spoon until all ingredients are well mixed. Store together in an airtight container, away from direct light and strong smells. Store together in an airtight container, away from direct light and strong smells. 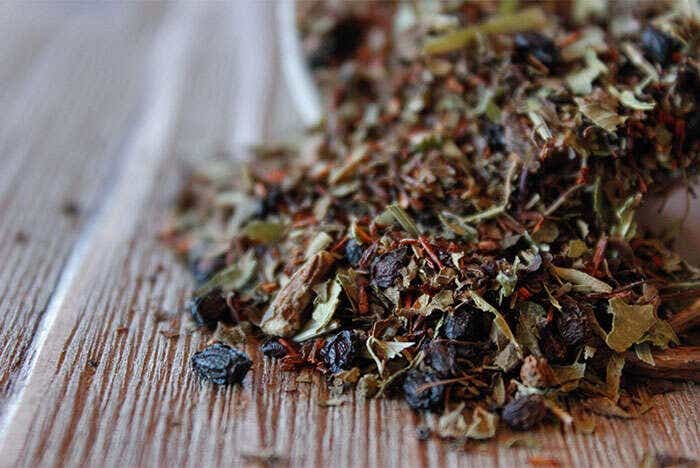 Measure and combine the herbal ingredients, stirring gently with a large spoon until all ingredients are well mixed. In separate bowl, add drops of Vanilla extract around the edges of the bowl, and then swirl to even coat the surface of the bowl. Add the blended tisane to this bowl, stirring with the large spoon to make sure of an even coverage. 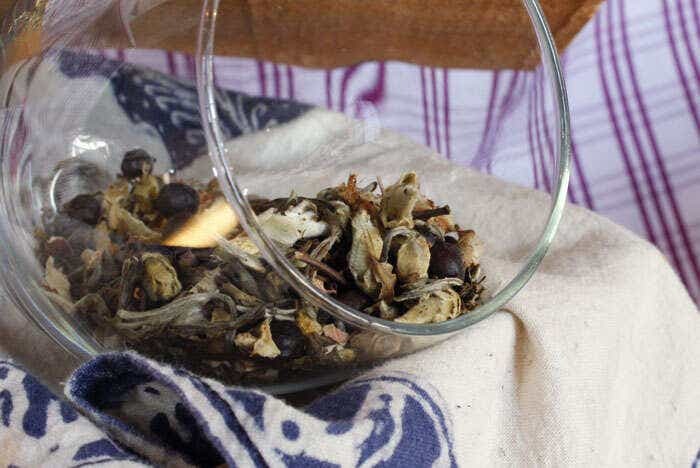 Cover the bowl with cling wrap and allow the aroma to infuse into the tisane 4-8 hours. Posted on July 14, 2015 at 3:48 pm. Great question! The ratios are all by weight. i love you for all this great recipes. For decades i try to figure out how to put essential oil in teas. My pleasure, Caroline! I hope you have fun experimenting with blending. The trick with essential oils is really to use the highest quality oil you can find, and always use food-grade essential oil when you can. Thank you so much for posting this, a lot of people on forums are not very sharing with their recipes (I completely understand but when you’re a novice its nice to have a guide) and this made me do a lot of research on things I’ve never even thought! I also purchased from your online store after reading this because the recipes seemed like they were blended with so much love. Thank you, Emily! I’m so glad these recipes were helpful. 🙂 Blending can seem intimidating at first, but can be plenty of fun when you begin to feel more comfortable with the idea. If you’re using high quality ingredients, then there’s not too much to worry about! Have fun with your blending adventures – and if you have any recipes you want to share, post back here! I know future readers would love to see what you come up with. I love you guys! This is just so wonderful. Thank you for sharing these great recipes! Our pleasure! 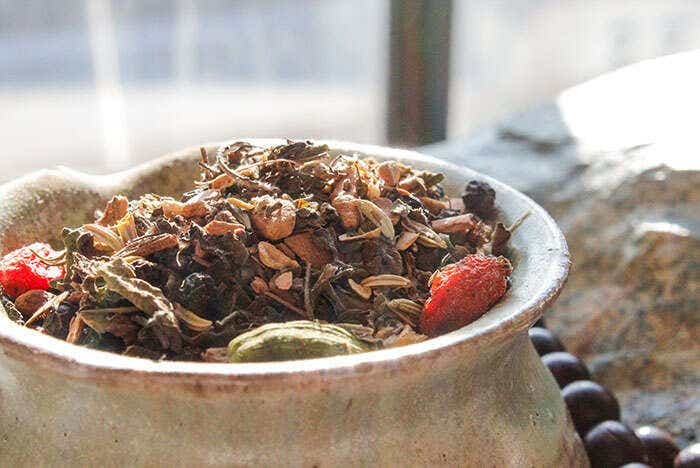 Blending tea can be really fun 🙂 and we hope these recipes take some of the mystery out of the idea. Grateful for being open. Would like to follow your blends but most of the requirements for the recipes are not available in my locality. 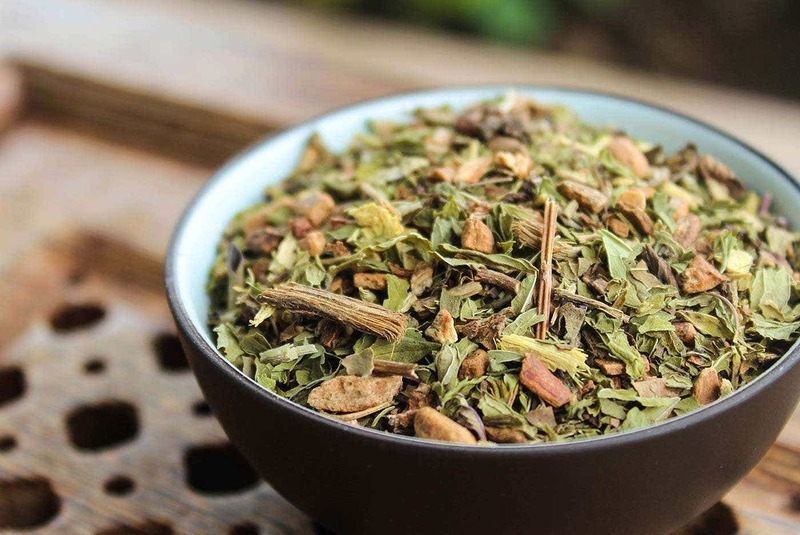 Please help with the best blending ratios for black tea and ginger and moringa with ginger. Hi Joseph – I would recommend experimenting! 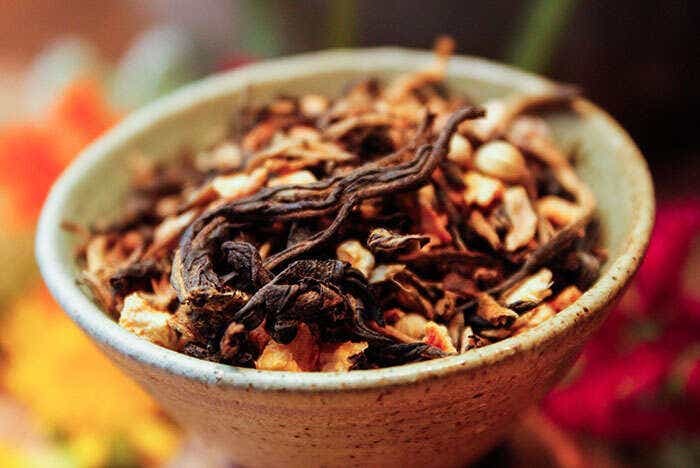 Every black tea will be a little bit different, and so will many ginger roots sourced from around the world. 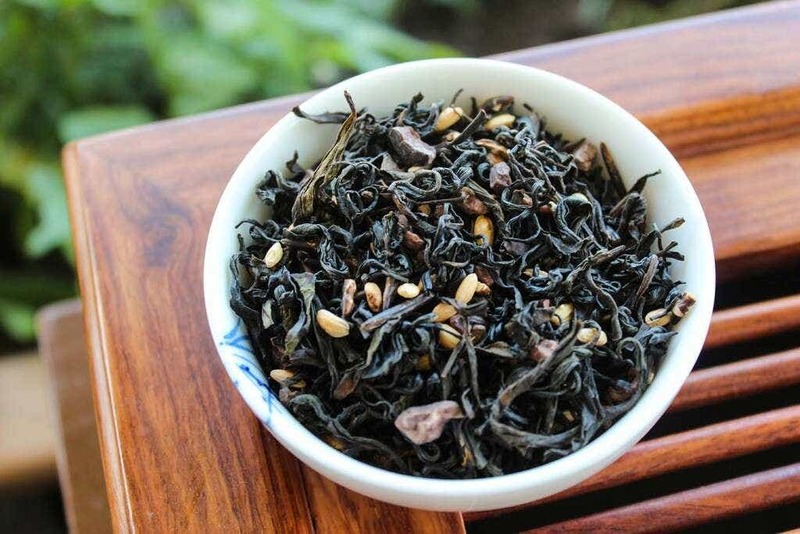 For example, I might use less ginger with a golden Yunnan Black Tea (like the Zhu Rong or Hand Fired Qianjiazhai Black Tea) than with Laoshan Black or Black Buds Jin Jun Mei, because the buddy Yunnan teas are already lighter, with more honey and a bit of natural spiciness already. 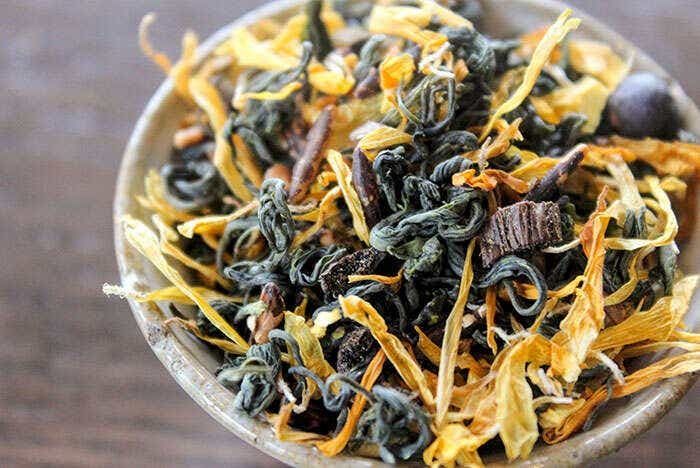 The darker, more robust black teas will need more ginger to break through and “read” as ginger. 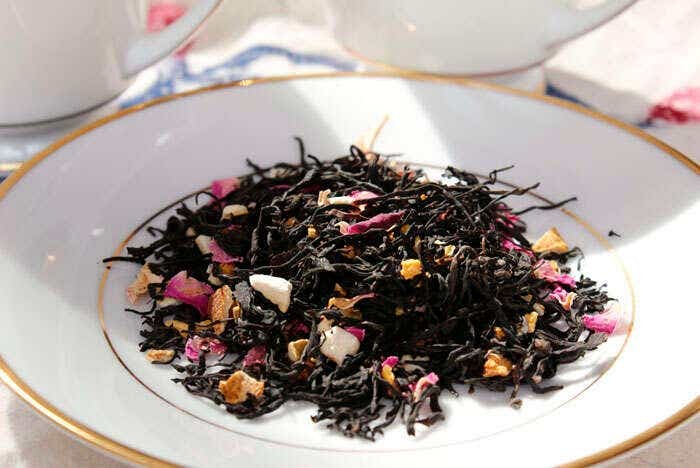 However, I might start with the ratios you see in the “Vanilla Citrus Spice,” which is essentially a black tea blended with orange and ginger: that uses 1 part ginger root and 4 parts tea. 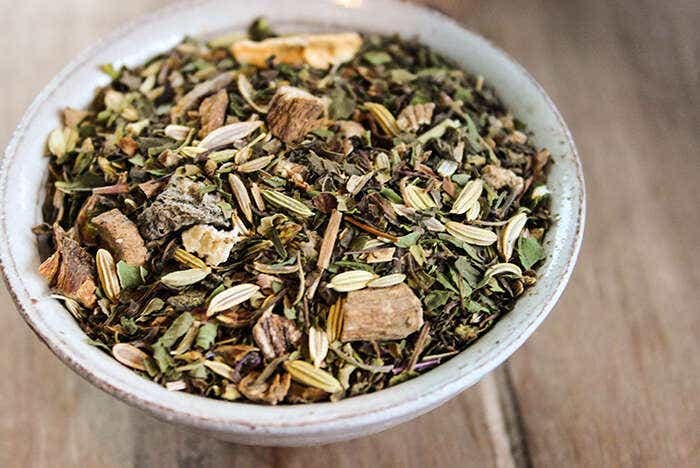 Luckily, ginger is a very tasty herbal brewed up just on its own, so you can feel free to use as much ginger as you want in a blend! 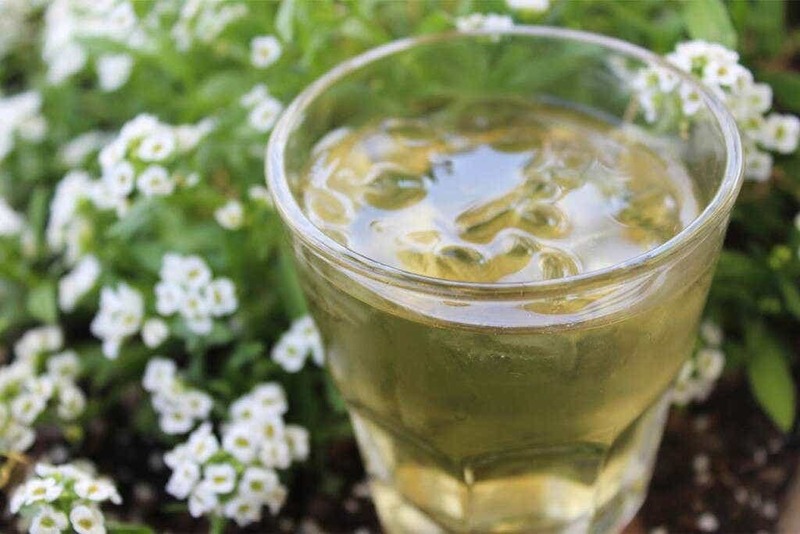 Try starting with a 4:1 ratio in one steeping, and if you want more ginger in your brew, try upping the ratio to 3:1 or even 2:1 the next time you brew. Have fun! Thank you so much for the blends. I’ve had this page bookmarked for a year and finally decided I’d attempt to begin blending and deepen my journey into tea. One question. It was my understanding that tea leaves absorb odor/scents and flavor over the duration of weeks (like how chinese jasmines are scented). 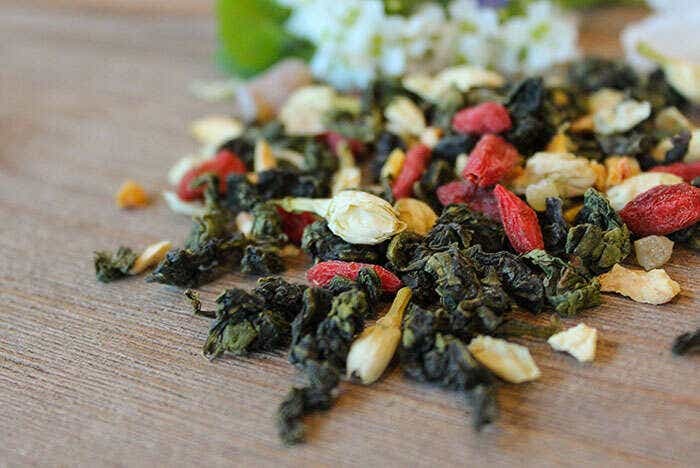 Would these tea blends need to sit in a closed container in order to truly absorb the character of the blend? Thanks in advance! Great question! 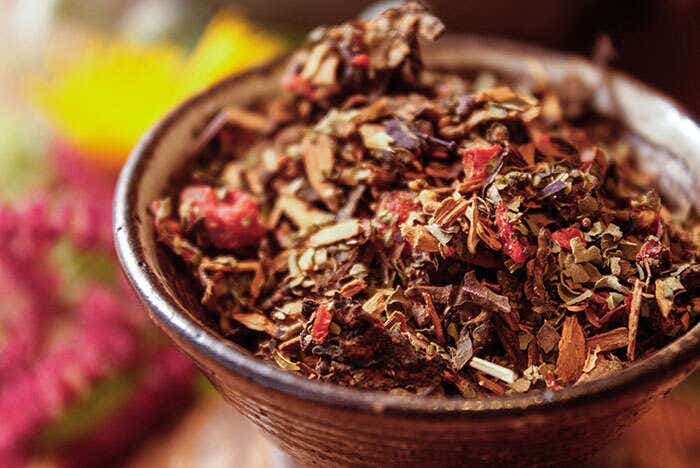 It is true that a just-blended tea will taste a little different than a tea you blended up a month of more ago. 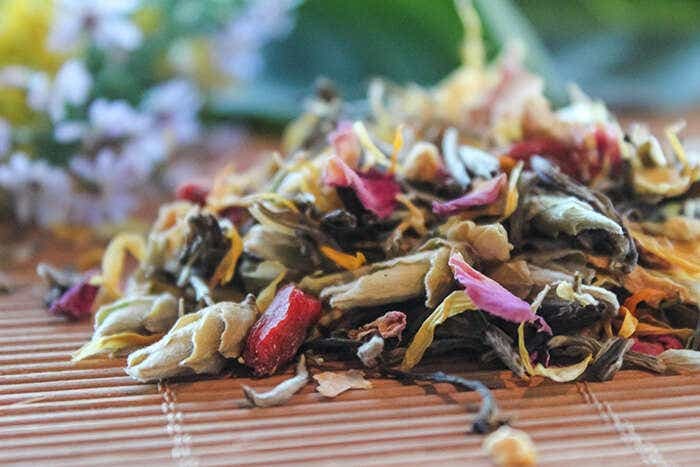 In general, some aromas will be absorbed by the tea leaves, but an even bigger issue is that over long periods of time, the most aromatic items in any blend will become less and less aromatic. Essentially, those big volatile aromatics you smell can disperse every time you open up the bag. That’s one reason we recommend storing any blends you make in airtight containers away from the light; this will help everything last longer. 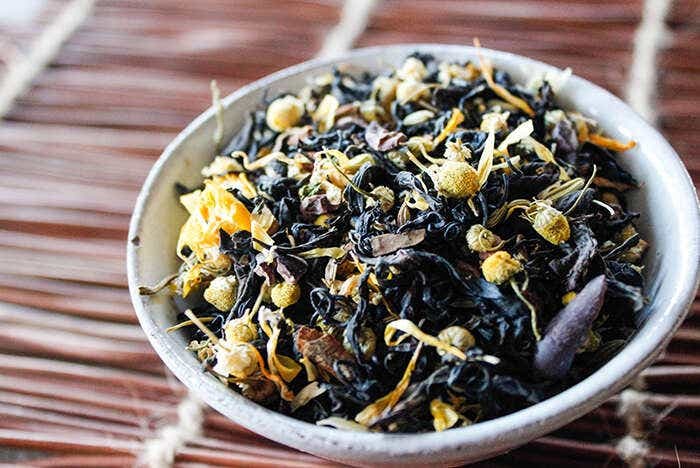 But in that same sense, when you first blend up a bergamot blend, for example, if you brewed the tea up instantly, it will be a much brighter and more bergamot-forward brew! 🙂 So letting the whole thing “calm down” for an hour or so or even overnight can help especially aromatic blends feel more integrated. In general, a day or two can be beneficial – especially if there are big aromatic oils in the blend. Recipes that benefit from some time to absorb aromas are noted, and are generally any blend that uses vanilla extract or bergamot. But in general, any of these blends can be enjoyed straight away. 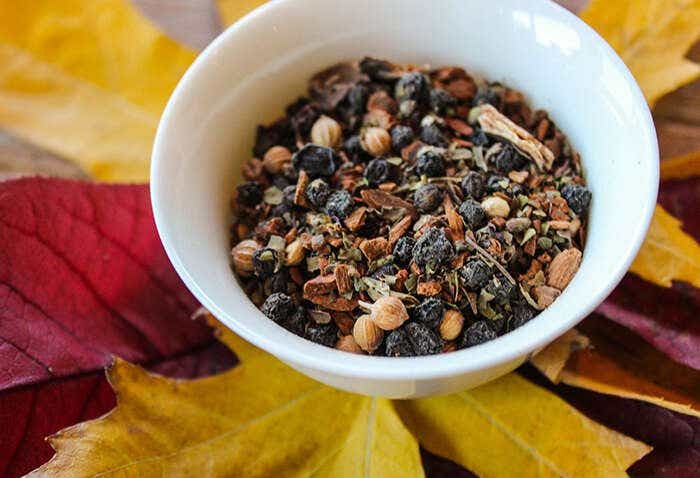 This is especially true with blends that are not scented and use whole ingredients only – these can be blended up for just one mug right before you add water. I hope this helps! Have lots of fun blending!! Thank you very much for such a detailed and comprehensive response! I very much appreciate it. I’ve had this website bookmarked for ages and I’m so happy to have done so. I’ll be looking forward to trying some of the shengs you have to offer soon!